The company pays tribute to Prism Sound's decades of customer support and dedication to quality audio. Cambridge, UK: Airshow Mastering Takoma Park, part of the US-based Airshow audio facilities group with locations in Boulder, Colorado and Takoma Park, Maryland is celebrating the installation of its fourth SADiE system, and is now running Prism Sound's latest SADiE 6.1 audio recording and editing software across its mastering suites. 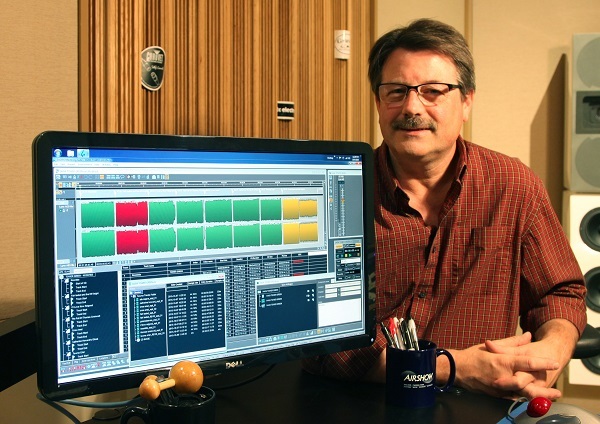 Senior Mastering Engineer Randy LeRoy, an experienced SADiE user, joined Airshow Mastering's Takoma Park facility in 2010. Since arriving at Airshow, LeRoy has mastered projects from some of the biggest names in country, bluegrass, folk, Americana and gospel, first working on a SADiE system back in the late 90s. "My previous company, Final Stage Mastering, installed a SADiE 24/96 system and a few years later added SADiE DSD 8 and DSD 2 turnkey systems," LeRoy says. "I brought the two DSD systems with me when I joined Airshow in 2010. In 2013, we replaced the Series 5 DSD 8 system with the new SADiE 6. To facilitate compatibility between both mastering suites, we now currently operate SADiE 6.1 in both of our mastering rooms." LeRoy chose to invest in SADiE systems because of their stability and easy work flow. "From our first purchase in the 1990s, the support I have been given has been unrivalled," he says. "The flexible signal routing, trim editor, bounce capabilities, CD authoring and ISRC .wav file support are just a few of the features I use on a daily basis. But above all, the biggest reason is simply that it sounds amazing. No other workstation gives me the critical and transparent results that SADIE systems deliver." Over the years, LeRoy has found that SADiE has fitted seamlessly into an ever-changing workflow. "From early serial machine control on Sony 1630 systems, CD-R burning, DDP authoring, plug-in support and the new 'WAV Master' feature, SADiE has always been a major piece of equipment, alongside my outboard analogue and digital processors," he says. "In the current world of audio manufacturers it's not often that a company remains as strong Prism Sound and SADiE have over the years. It's a testament to their dedication to providing audio gear that can last for, and be supported for, a lifetime." LeRoy has recently mastered projects for country artists Jamey Johnson, Amanda Watkins, and Brooke Hogan, americana artists John Cowan, Andrea Zonn and Colin Hay, and bluegrass artists Larry Cordle, Frank Solivan, and Bryan Sutton. Solivan and Sutton releases mastered by LeRoy were both nominated for 2015 Grammy Awards for Best Bluegrass album. Find out more about Airshow Takoma Park at www.airshowmastering.com. With no dedicated proprietary hardware requirements, SADiE 6.1 software packs are application-based and focus on the core SADiE expertise of mastering, radio production, TV/film post, archiving and restoration, and high-level sound design. Prism Sound has also announced a new, competitive pricing structure for its SADiE software packs, with the entry-level SADiE6 Pro now starting at under USD800 (GBP445) excluding tax, taking the SADiE brand into new markets. For more information on Prism Sound and SADiE systems, please visit www.prismsound.com or www.sadie.com. SADiE's new mastering toolkit saves Eric Boulanger "hours and hours"
*All asterisked fields are required. Note that we require the country information in order to refer you to your local dealer where appropriate. Please see also our privacy statement for information about how we use any data you supply.